Saigon Cheesesteaks for the WIN-NGUYEN!! 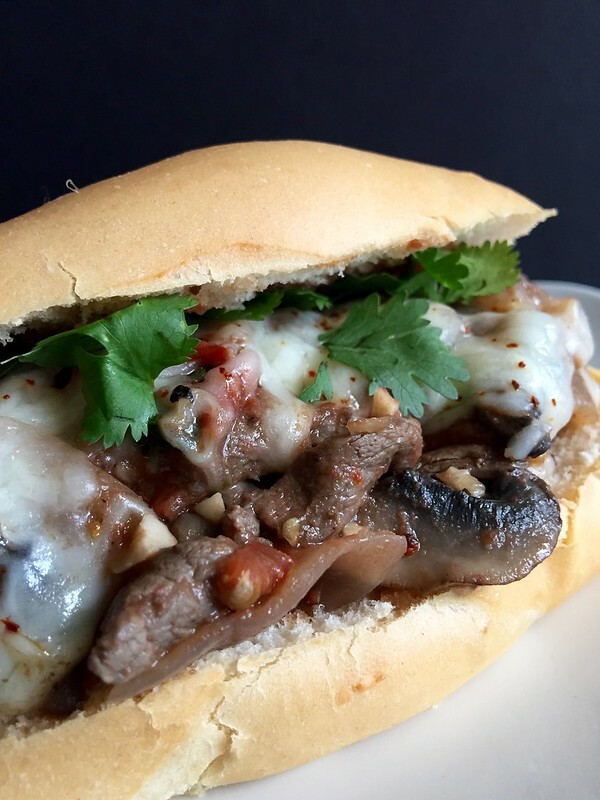 Sometimes I like to do C-R-A-Z-Y things…..
You know – kooky things like mashing up Philly Cheesesteaks with the comforting Vietnamese Thịt Bò Xào. Say Whaaat???? I know, but just hear me out. 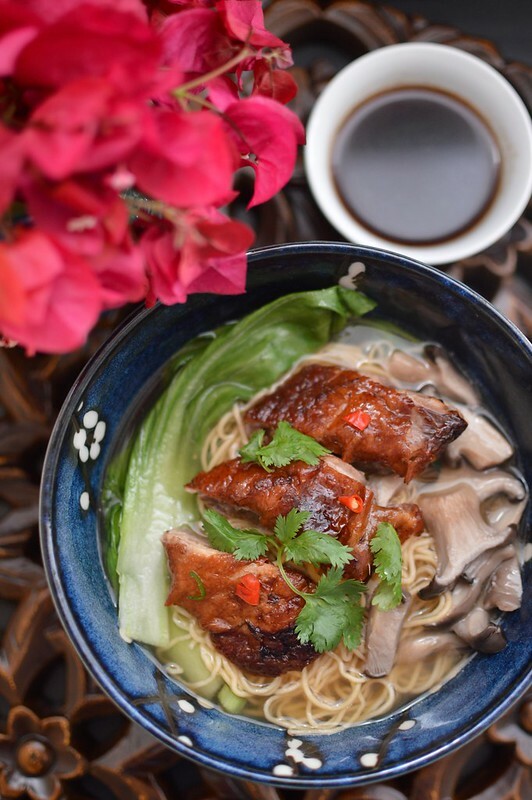 Thịt Bò Xào is a quick beef stir-fry we used to eat weekly growing up and we all loved it. 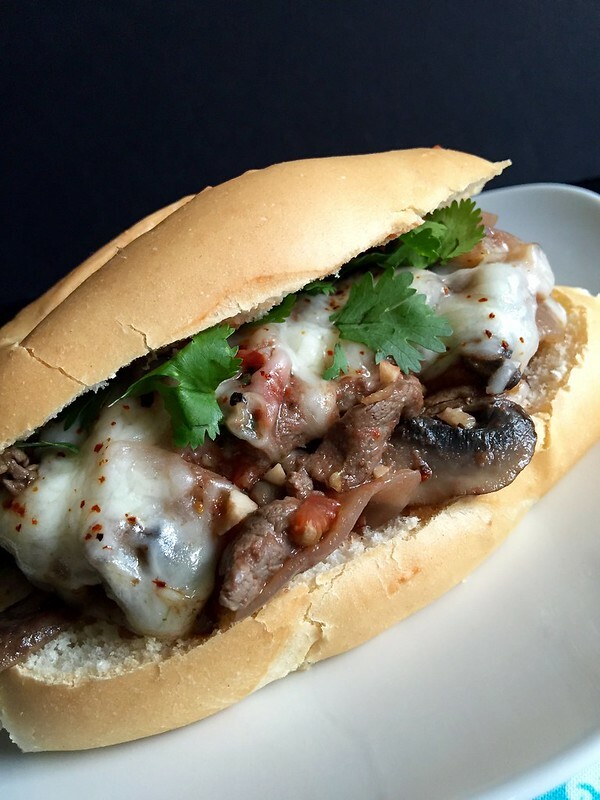 It was hearty, garlicky, and well–beefy! 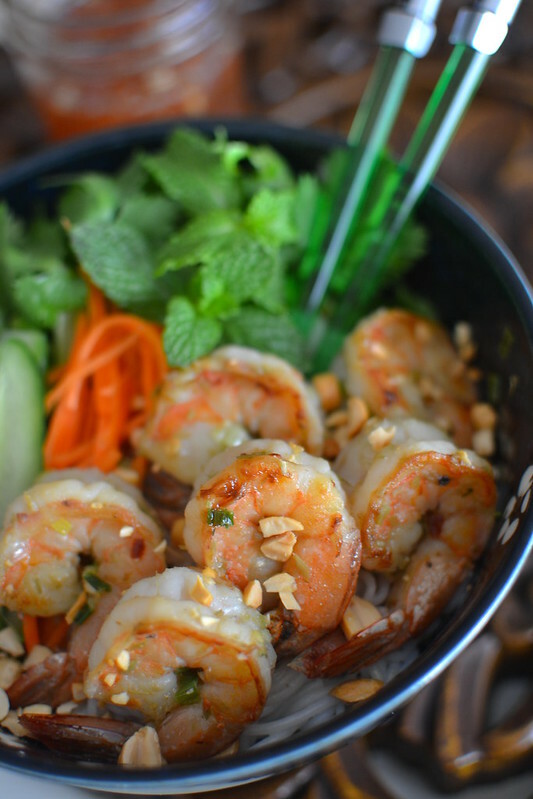 The added bonus is the wonderfully rich sauce it created that we use to spoon over our rice bowls. The other night I was about to make up a pan of Thịt Bò Xào when I caught a glance of leftover hoagie rolls sitting on the counter. And that’s when I got struck with a bit of genius! Or madness! Sometimes it’s a blurry line with those two characteristics. 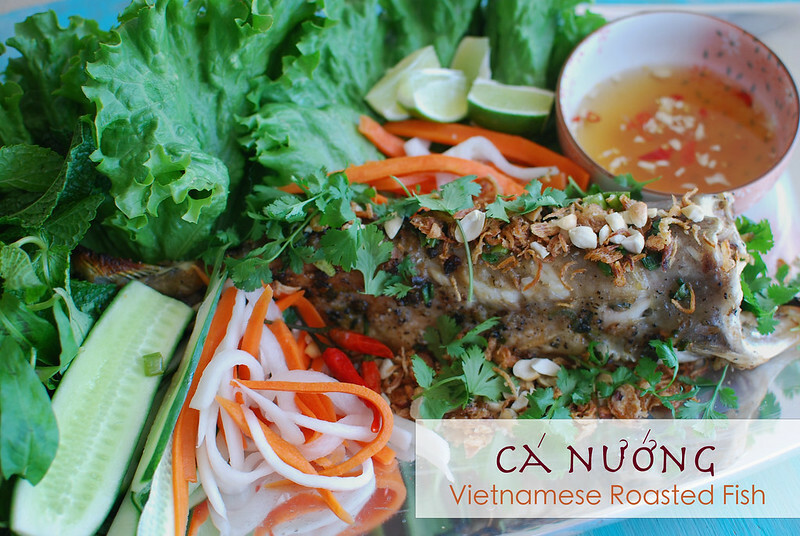 Why not throw the Thịt Bò Xào inside a roll and top it off with cheesy goodness? Ain’t nothing bad about that! So I rolled the dice and gave it try! I stir fried some ribeye beef and veggies, added a few slices of pepper jack cheese, stuffed it inside the hoagie and topped it with some bright cilantro leaves. And no surprise here–it was AWESOME!! 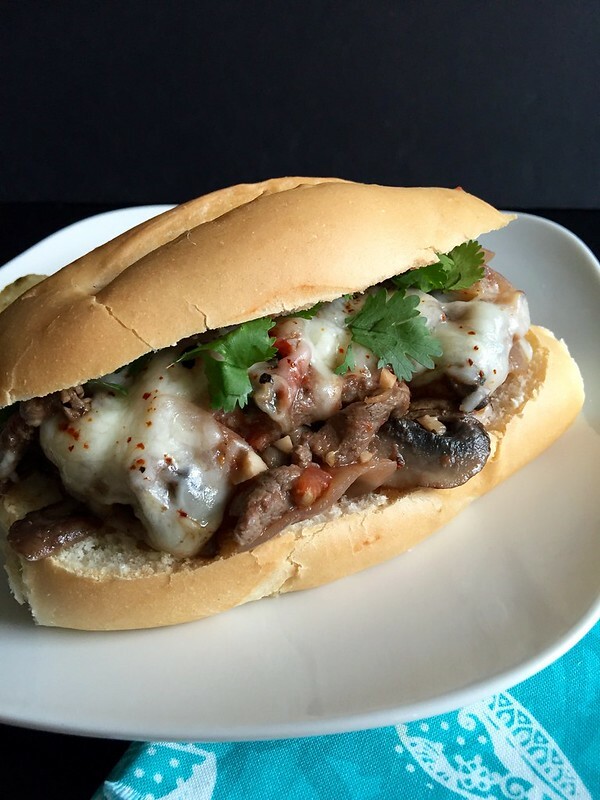 The beef had the same type of richness like the beloved Philly Cheesesteaks but the Asian flavors combined with that luscious sauce I had mentioned was a definite game changer! Don’t get me wrong, I’m not knocking the Philly Cheesesteak because I’m one of its biggest fans! But this is a fun twist and I do love variety! And since this weekend kicks off College Football Season (FINALLY! )–it gives me the perfect excuse to whip up these Saigon Cheesesteaks again as I cheer on my beloved ❤ Trojans as they take on Crimson Tide! In a small bowl, mix together the beef, garlic, cornstarch, 1 tablespoon vegetable oil and black pepper. Set aside. 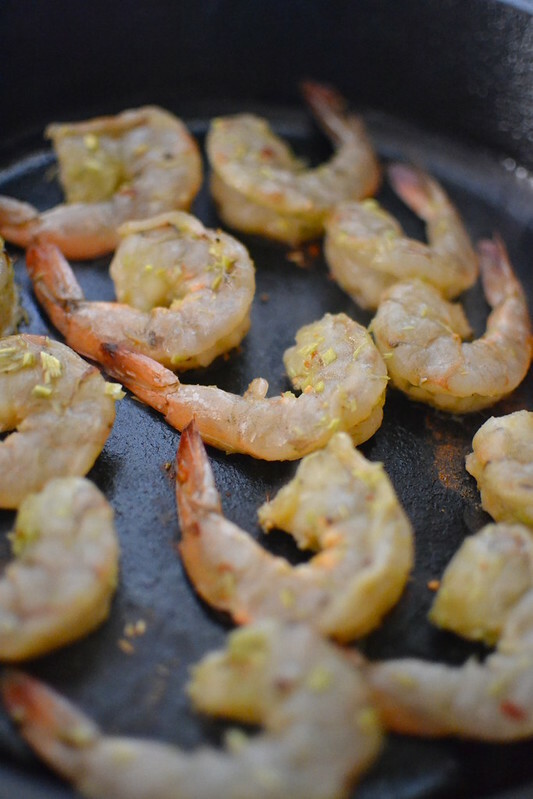 Heat the remaining vegetable oil and butter in a large wok or nonstick skillet over medium heat. 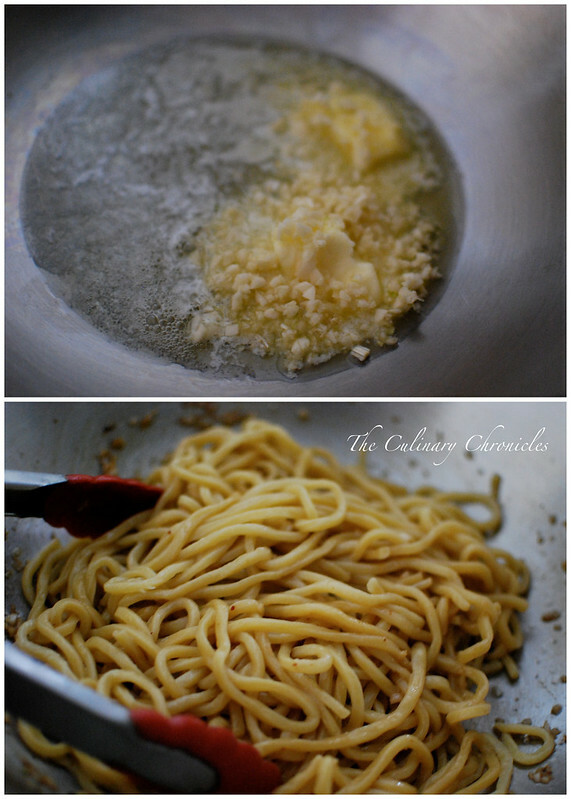 Swirl the pan around until the butter melts. 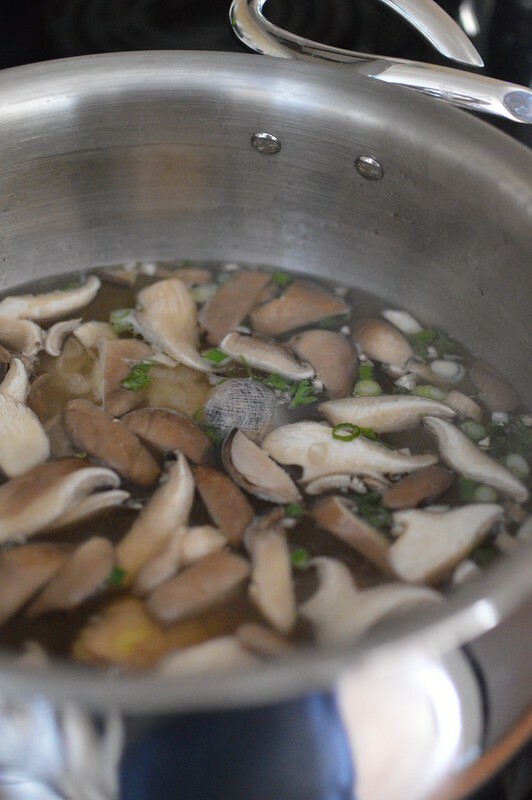 Add onions and mushrooms and cook until both have softened and become lightly browned, approximately 4-5 minutes. Add tomatoes and cook for an additional 2 minutes. Push the items to the side of your wok/skillet (or remove to a plate if your wok/skillet is not large enough) and add the beef. Turn the heat up to medium-high and quickly stir fry the beef for 1-2 minutes or until lightly brown. This should not take a long time since the beef is so thin. Mix the onion/tomato/mushroom mixture together with the beef. Stir in Maggi (to taste) and additional cracked black pepper if desired. Pull the pan off the heat. Keeping the mixture in the pan, divide it into two. Place the cheese slices over each of the portions and cover with a lid until the cheese melts. Open each roll and add half the meat mixture inside. Sprinkle the tops with red chili flakes and cilantro. You know that I adore Spring and Summer. In fact, I’m a Sun Baby through and through. It may be a result of those early years where I froze in the Minnesota snow and now I’m at my best when I can feel the warmth of the sun on my face and can wear my flipflops 365. But with that said, I think you’re playing a cruel practical joke on me this late in the game. 90+ degree weather EVERY day this week?!?! And that’s with mi casa sitting on the coast. Where or WHERE did you send my beloved Pacific Ocean breeze? My poor puggle and I are melting. Lately, all I want are Spring Rolls and popsicles….and slurpees. 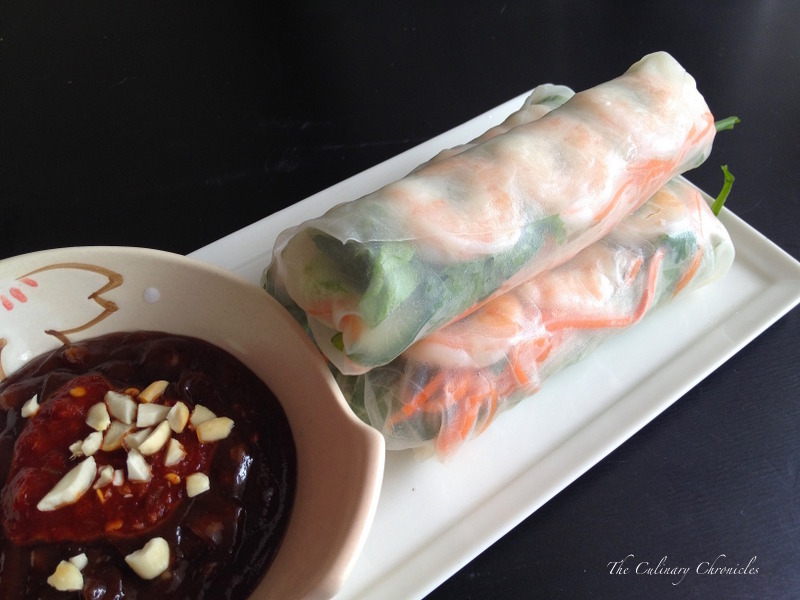 Gỏi Cuốn, as you know, are Vietnamese spring rolls….sometimes noted as “summer rolls”. They’re light, filled with veggies and low maintenance. 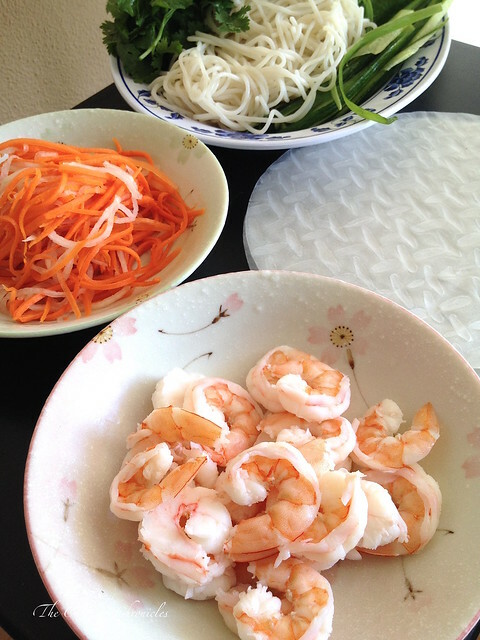 Thankfully, because I can barely muster enough energy to boil water to cook the vermicelli noodles and poach the shrimp. 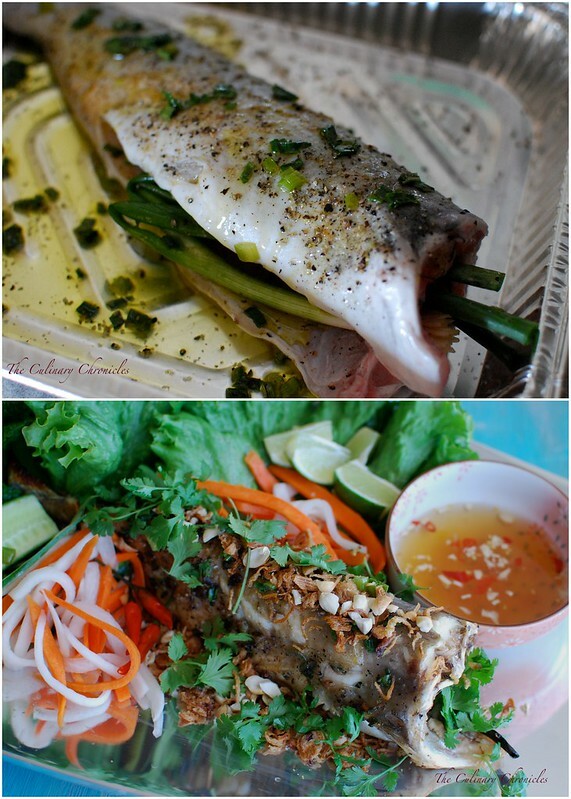 And lucky for both of us, I don’t like poached pork belly which is commonly used in Vietnamese spring rolls. It gives me one less thing to worry about. Now, if my face wasn’t melting off my head (is that T.M.I.? 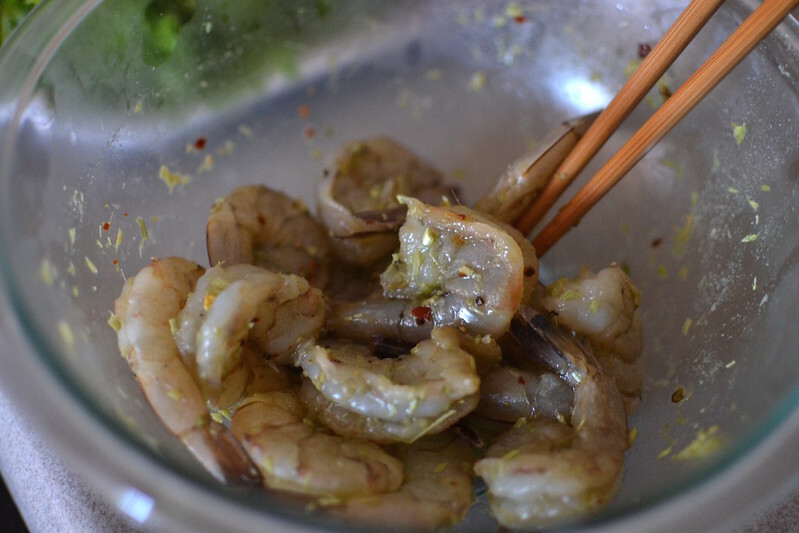 ), I’d marinate the shrimp in a little garlic, fish sauce and then grill them. 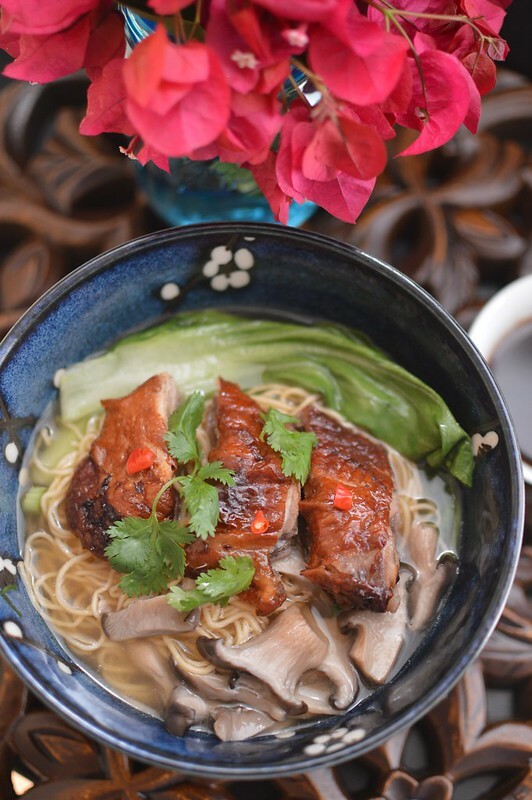 It really does add that extra oompf of flavor but trust me, poaching them are just as delish. 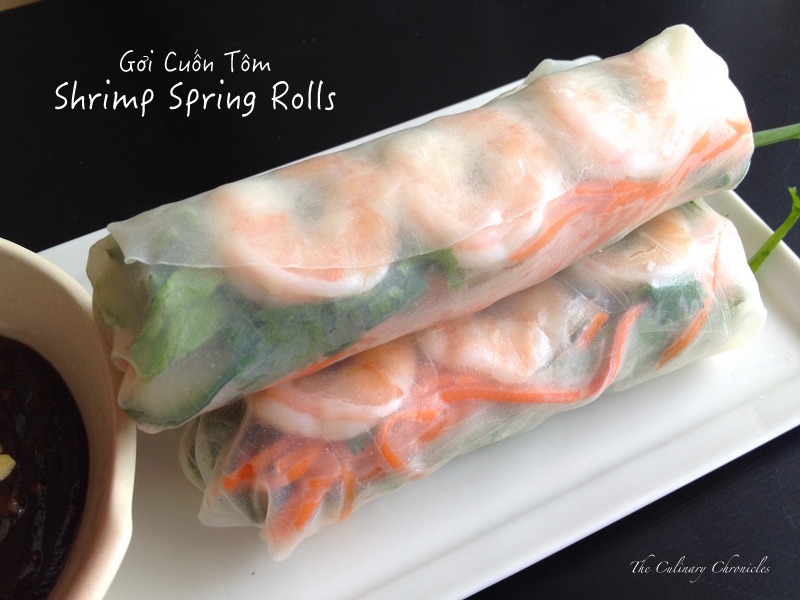 Oh–and Mother Nature, if you’re fixing up some spring rolls, feel free to add in other herbs and veggies you may have on hand….bell peppers, bean sprouts, Thai basil…. And thin slices of poached pork belly if it tickles your fancy. And once you’re done making your rolls, could you find it in your heart to send back our “normal” weather? We would love you even more….like, times infinity. 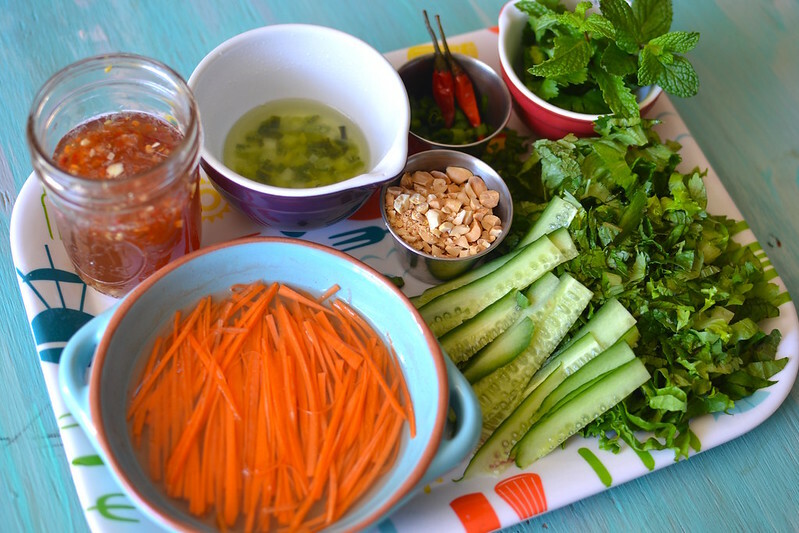 Prepare the đồ chua (pickled vegetables). In a medium sized bowl, dissolve the sugar and salt with the boiling water. Add the vinegar and allow the liquid to cool to room temperature. Add the carrots and daikon and refrigerate for at least 1 hour. 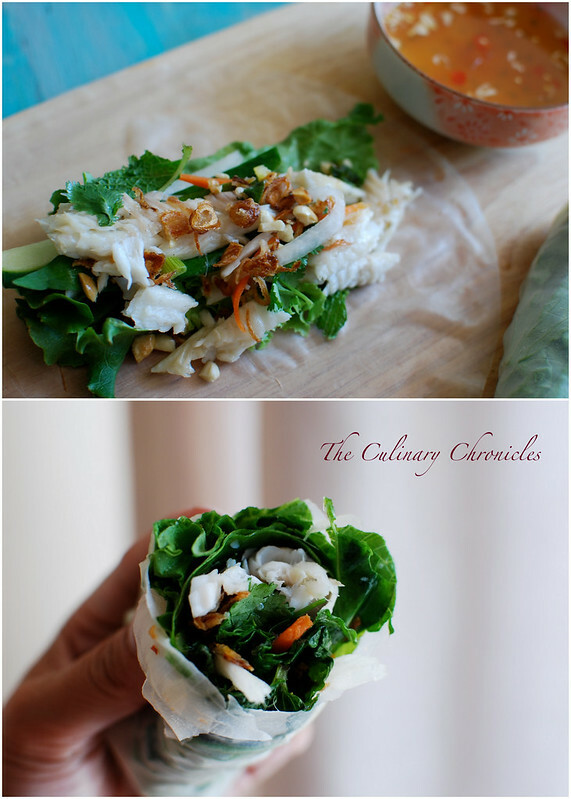 *This can keep in a sealed container in the fridge for 2-3 weeks and are a must in Vietnamese sandwiches (bánh mì). 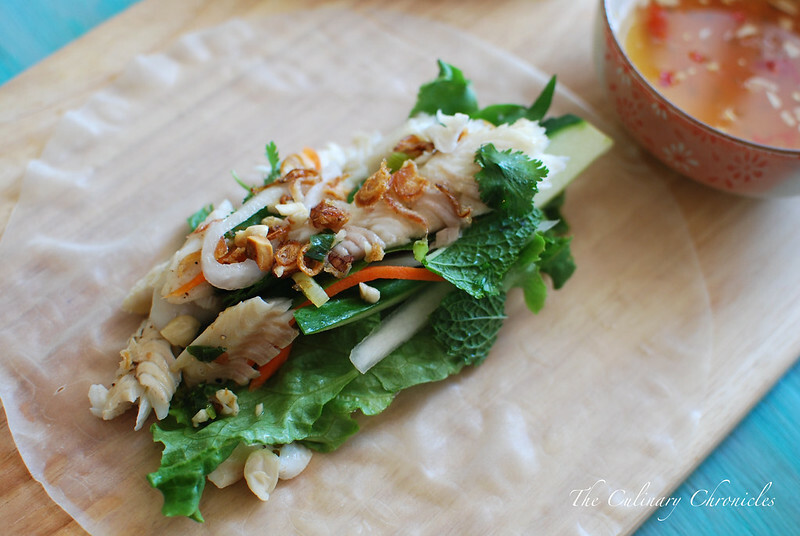 Dip one rice paper sheet in warm water and place on a flat surface. The rice paper will slowly become pliable. 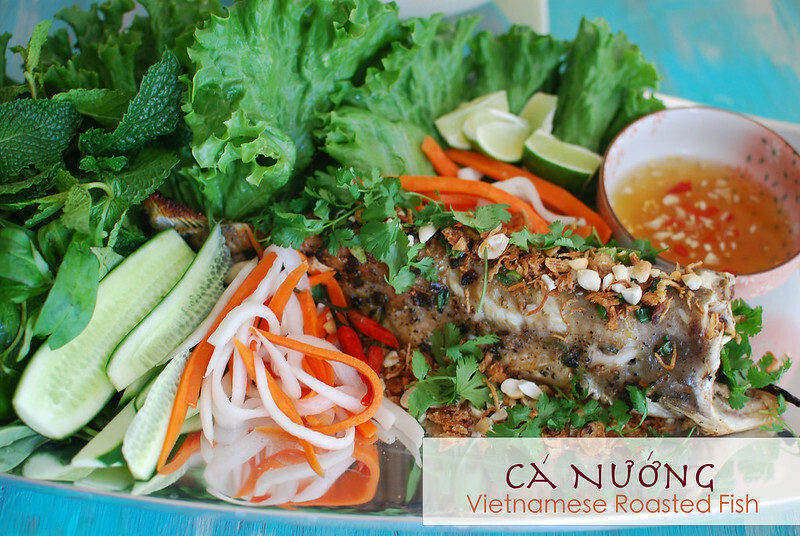 Lay one piece of lettuce in the middle of the rice sheet and top with vermicelli noodles, cucumber slices, mint leaves, cilantro leaves, Thai basil, Vietnamese coriander and some of the refrigerated đồ chua. 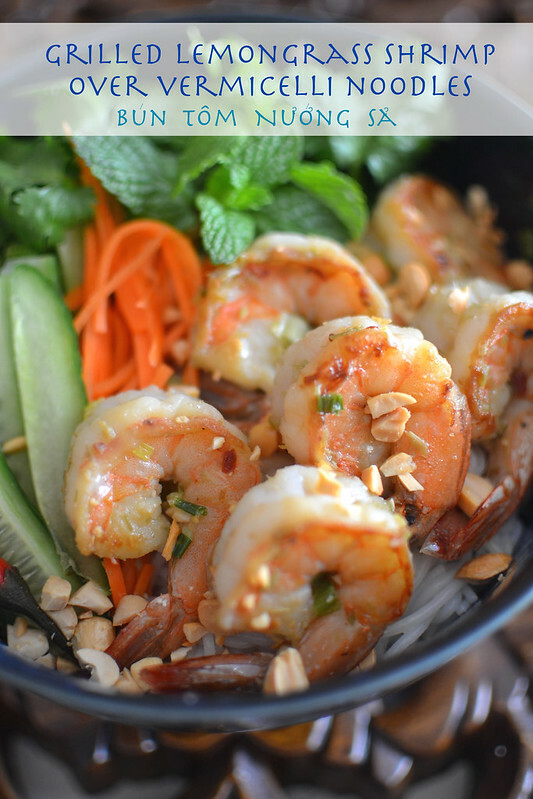 Lay 3-4 shrimp slices, cut side up, in one line above the layer of vegetables. Tightly roll the bottom of the rice paper over the mound. Fold the right side of the roll in and lay one scallion/chive above the roll. 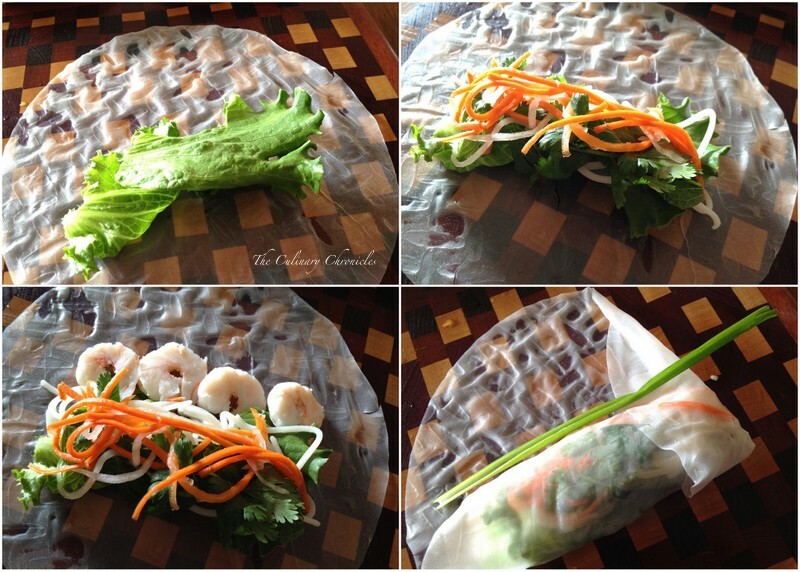 Fold the left side in and continue rolling the rice paper up until you’ve created a secured roll. Repeat with the remaining ingredients. 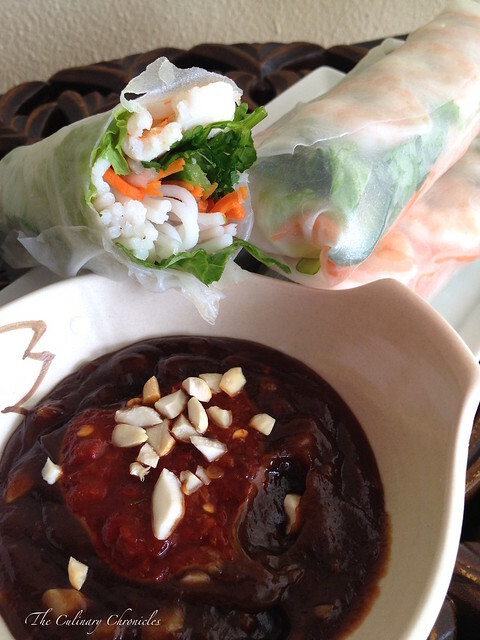 Serve at room temperature with hoisin peanut sauce or other dipping sauce of your choice. Well gang…in true Nam form, I’ve waited to the last minute to finish scrubbing down my house. And I need to get my act together because tomorrow is the beginning of Tết – the Lunar New Year! But hey — I get points for having the majority of mi casa scrubbed down, lì xì (lucky money in red envelopes) all ready, ancestral altar is up and Bella got a bath. It’ll be a mad rush over the next few hours but it’s Tết and it needs to be done to optimize my luck for the year. I don’t like to gamble with bad ju-ju…especially since the Year of the Sheep (or Ram) is predicted to be a good one for me. It’s going to be a crazy time with the family and I’ll be headed up to Orange County in a day to begin the shenanigans with them. Lots of food, lots of booze, loud talking (we’re not arguing–we just speak HELLA loud), lots of kids, lots of games and if all goes well, a lot of luck and prosperity for my o’hana. 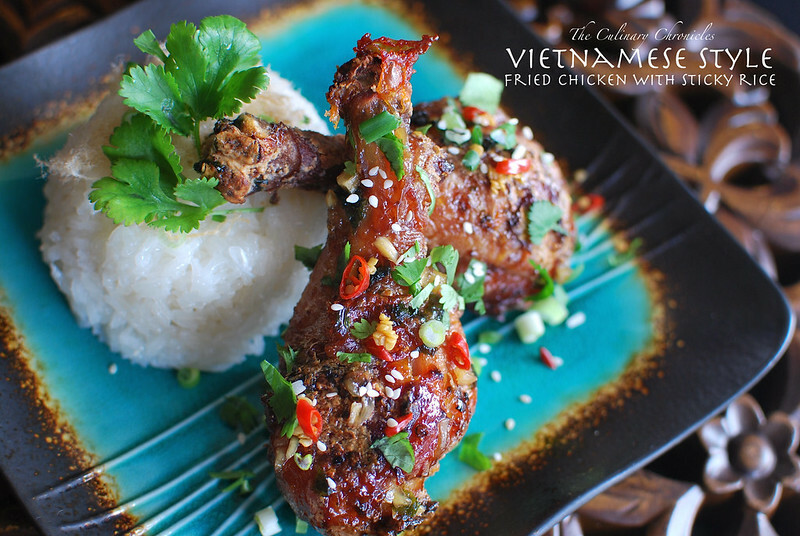 To celebrate Tết, I wanted to share my Xôi Gà Chiên Nước Mắm which is sticky rice served with Vietnamese style fried chicken (aka…marinaded in fish sauce). 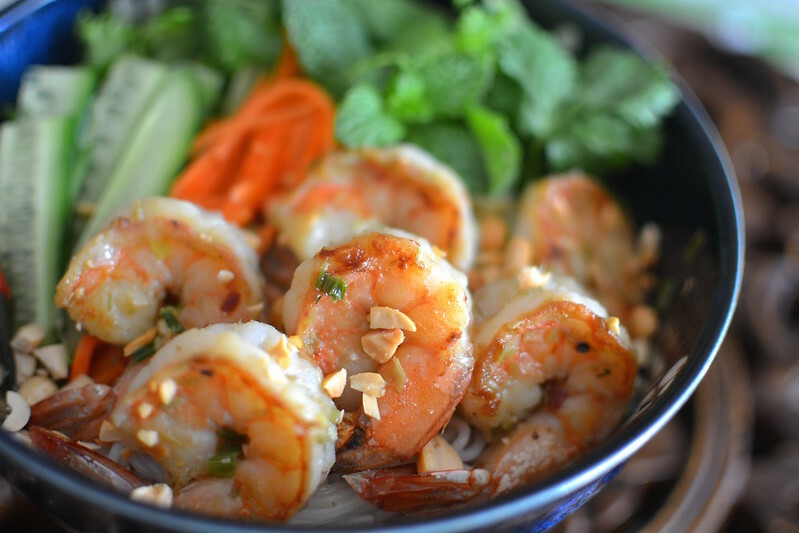 It’s not a traditional Tết dish but it’s so darn good! 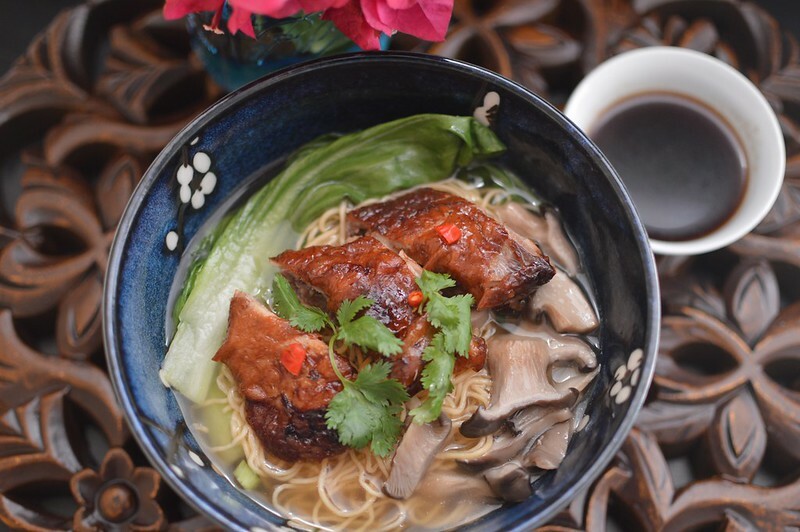 Fried chicken swathed in a sticky, sweet, salty and spicy sauce –everything that speaks to the Vietnamese palette. Couple it with sticky glutinous rice and it’s HEAVEN! So to you my dear friends, Chúc Mừng Năm Mới!! Wishing you all an extremely fulfilling, prosperous, joy filled, healthy and delicious Year of the Sheep!!! 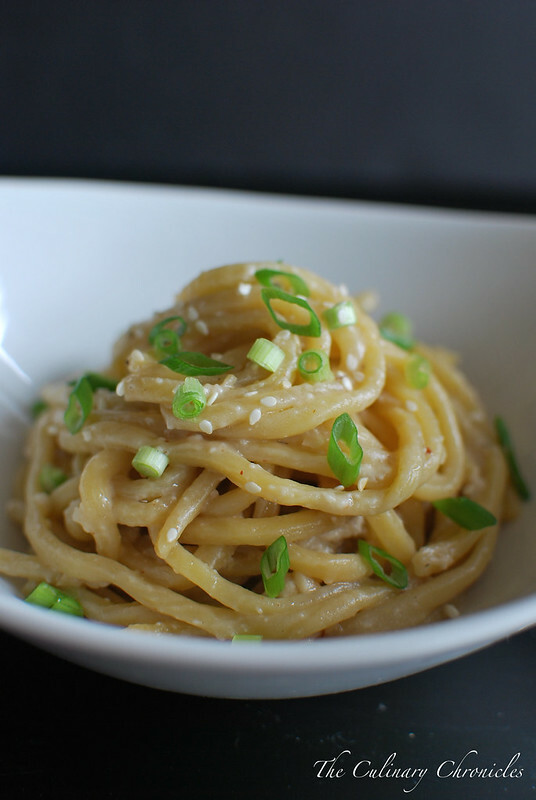 In a bowl, whisk together the fish sauce, sugar, water, shallots, garlic, ginger, chilies and black pepper. 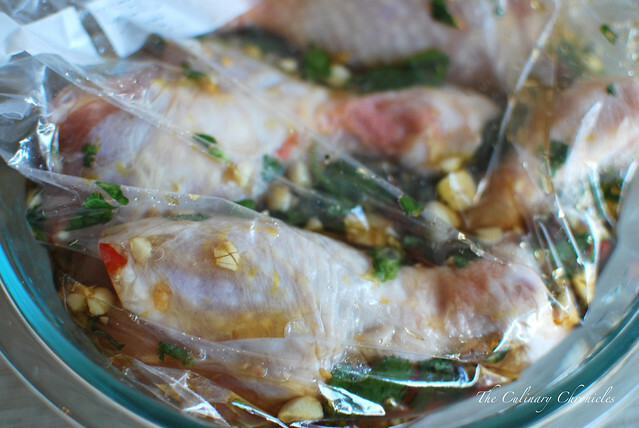 Pour the marinade into large gallon Ziploc bags- you may need more than one depending on the size of the chicken. Rinse the chicken under cool water and pat dry with paper towels. Place the chicken inside the Ziploc bags. Massage the chicken in the marinade and try to get most of the air out of the bag before sealing it. Put the bag(s) of chicken in a large bowl in case it leaks and refrigerate for 3-4 hours. An hour before you start cooking the chicken, pull it from the refrigerator to take the chill off of it. 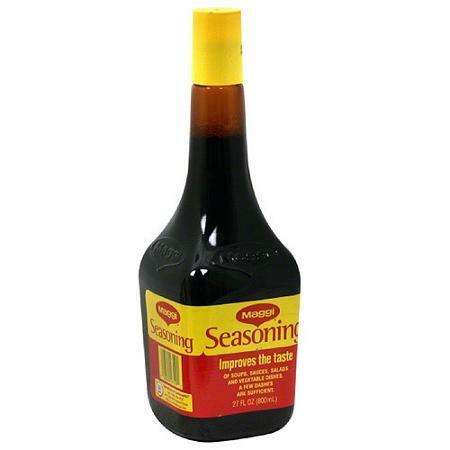 Pour the marinade into a small sauce pan and set aside. Fill a large, heavy bottom pot with about 2-3 inches of the oil. Heat the oil to 350 degrees F.
Take the chicken and use paper towels to blot off the excess moisture. 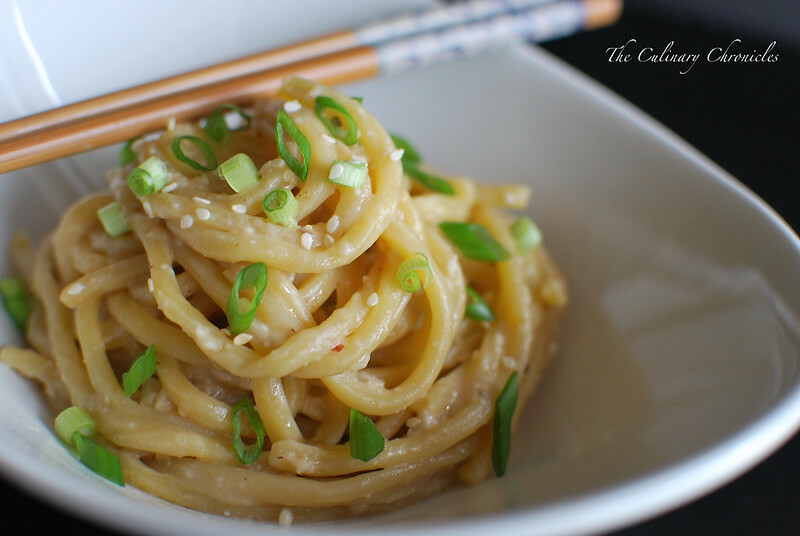 In a large bowl, whisk together the rice flour and all-purpose flour. After the oil comes to temperature take a few pieces of chicken at a time and roll it into the flour mixture. Shake off any excess flour and carefully place the pieces into the oil –being careful to not overcrowd the pot. 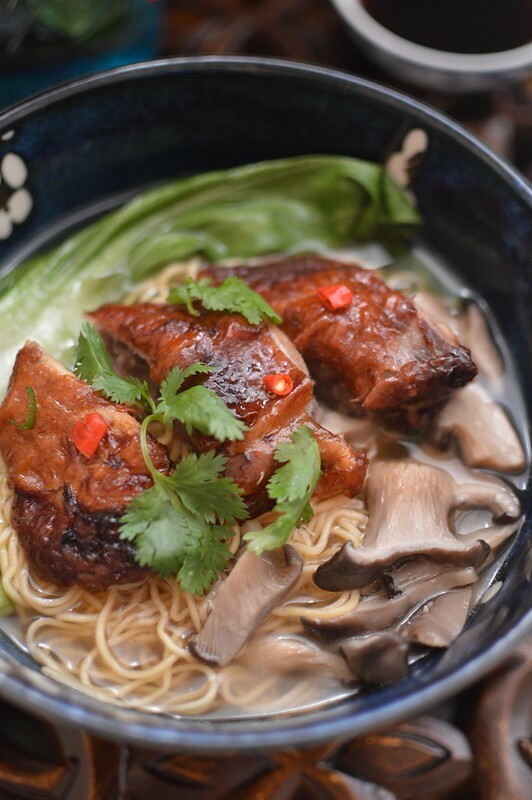 Depending on the size of the chicken, allow the pieces to fry for 10-20 minutes or until the internal temperature reaches 160 degrees F. Once done, allow the chicken to drain on a wire rack. 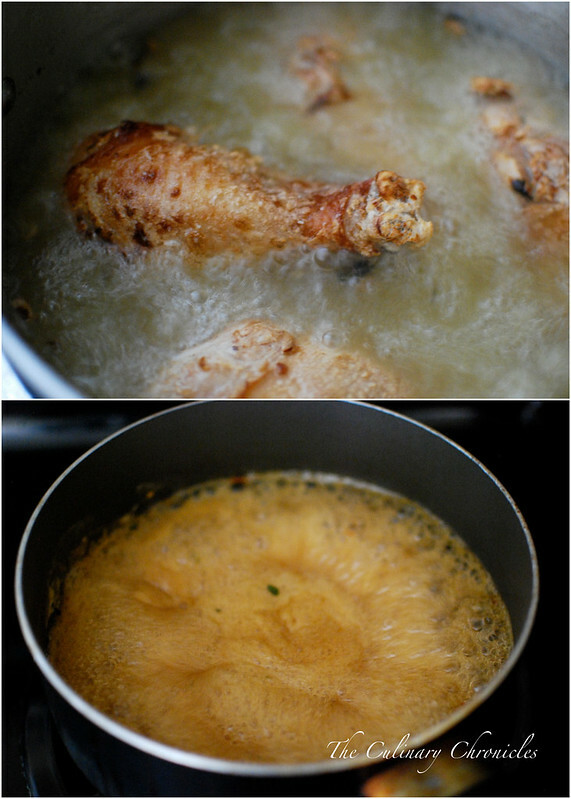 Continue dredging and frying until all the chicken has been cooked. 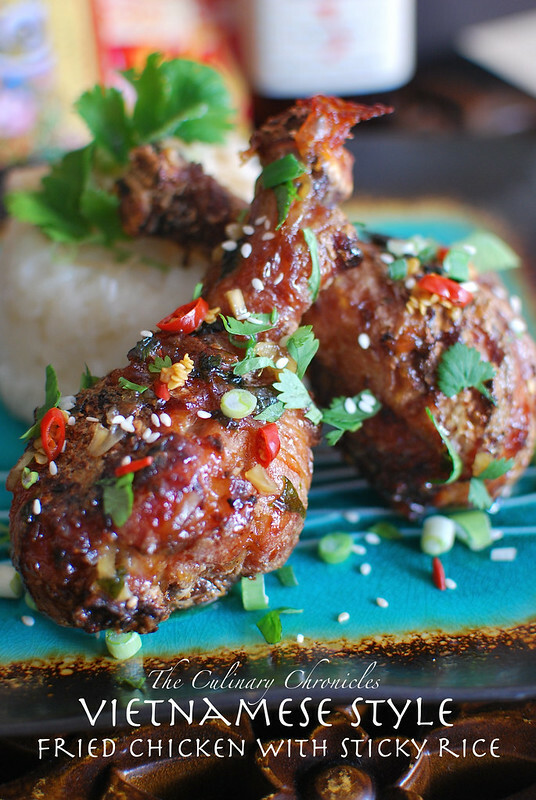 While the chicken is frying, cook the marinade over medium-low heat until it reduces by half. Toss the fried chicken into the reduced marinade. Plate with a portion of sticky rice and sprinkle with toasted sesame seeds, minced chilies, chopped scallions and chopped cilantro. Serve warm.